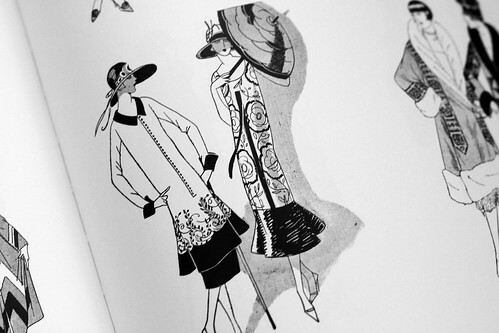 This is a lovely book of drawings of 1920’s fashion. I bought this book last year at the Samuel French bookstore on Ventura Boulevard. Rick and I stop there when we are in the neighborhood. The store is a wonderful resource for books relating to theatre and film. I fell in love with this book. 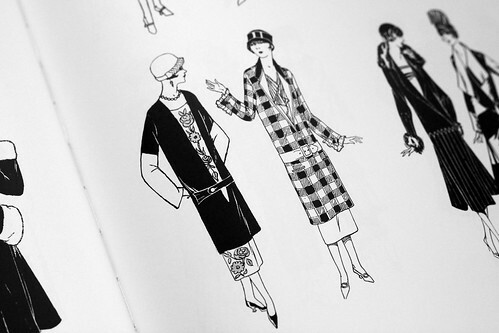 It has 8 to 12 little black and white drawings on at least 100 of the 408 pages. That is a lot of inspiration. There are many color pages too. This book will be big help in deciding where to place embroidery designs, such as the black rose from a previous post, on a garment. The photo above is labeled with the ISBN 9789054961352 to help with finding it online. I found a few books for a reasonable price doing a google search, but like all out of print books, some prices are exorbitant. I paid the list price, I wouldn’t recommend paying more. Here are a few pages that I particularly like. 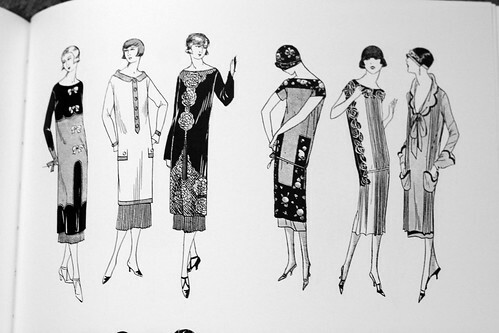 I want to make the scalloped collar on the right and have been thinking of ways of doing the contrast edging easily. It might have to be trim, since binding scallops is not easy. I like the hem below. This has the scallops following the embroidery. Having the embroidery peek out on an under dress is nice too. Many of the photos I took were really blurry. So this is all I have to share right now. I do need to stop looking at books and actually make something. That will be my resolution for this year. Best wishes for your health and happiness in 2013. 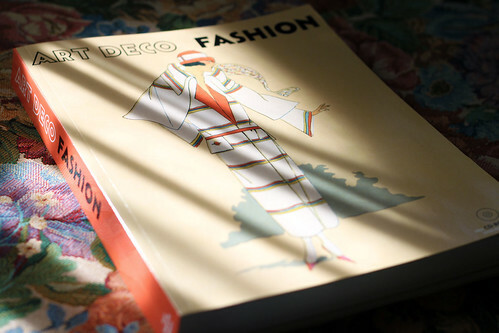 This entry was posted on Wednesday, January 2nd, 2013 at 6:35 pm and is filed under Book, Embroidery, Sewing and Vintage. Tagged: Clothing, Embroidery, Sewing, Vintage. You can feed this entry. You can leave a response, or trackback from your own site. Oh to be thin enough to wear styles that like!! Love all the attention to detail – especially anything with scalloped edges. Have fun! Darlene Zimmermann has a wonderful method of binding quilt edges with scallops – don’t know if it could be applied to your garment construction but might be something to think about. This looks like a fantastic book. Love those styles.